Early results show Mitt Romney with a strong lead against his Democratic opponent Jenny Wilson. Early results showed Romney leading his Democratic opponent, Jenny Wilson, 62 percent to 31 percent. Romney took the stage at his Orem campaign headquarters just after 8:30 p.m. Flanked by his wife Ann and several of his grandchildren, the 71-year-old paid tribute to fallen Utah soldier and North Ogden Mayor Maj. Brent Taylor, who was killed in Afghanistan earlier this week. In his final Facebook post before he was killed, Taylor urged all Americans to vote. The former GOP presidential nominee shared his vision for a return to bipartisanship in the Senate, which he said he hoped to help kickstart. Romney hit on several of his campaign themes in a short victory speech, including controlling the U.S. deficit, immigration reform and fighting federal overreach. Wilson, who will keep her at-large seat on the county council, said she was not done working for all Utahns. “I am in it until the people of this state are respected, no matter where they’re born or who they love. And I am in it until the Trump rallies of division and hate are a thing of the past,” she said. Despite Wilson’s efforts to paint Romney as an outsider with an inconsistent policy record, even referring to him as “Multiple Choice Mitt” during their only debate, she was no match for Romney’s deep-pocketed and well-oiled campaign, which raised more than $5 million. Sen. Mike Lee, now Utah’s senior senator, joined Romney onstage and welcomed him to the U.S. Senate. Sen. Mike Lee congratulated Mitt Romney on his win. Gov. 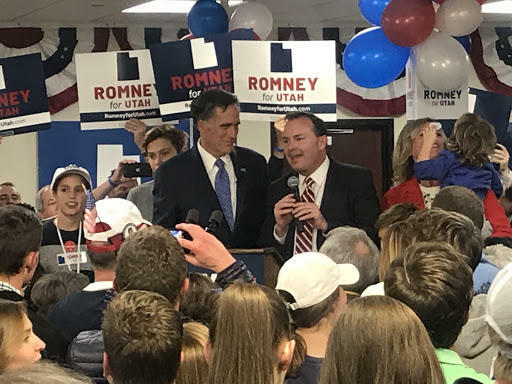 Gary Herbert, Lieutenant Governor Spencer Cox, Attorney General Sean Reyes and other Republican officials were also on hand Tuesday night to congratulate Romney on his victory. Political observers largely expected Romney to win, and many were curious how he would handle his relationship with the Trump administration during the campaign and in the Senate. Despite winning in Utah, Trump’s popularity has waned considerably since his election. While Romney was a sharp and early critic of Trump in 2016, famously calling the then-presidential nominee a “phony” and a “fraud,” Romney, who Trump briefly considered bringing into his cabinet as Secretary of State, has walked back his criticisms of the president since announcing his candidacy in February. Last month he denied he was ever a leader of the “never Trump” movement. Romney avoided any mention of the president Tuesday night. Throughout his campaign, he has praised the president’s legislative achievements while holding him at arm’s length. Romney had also campaigned on the arguement that should he win the Senate seat, he would be poised to accomplish a great deal more than most junior senators. “He has Mitch McConnell’s ear already, which is huge for a guy that’s coming in for the first time,” said Romney supporter Richard Galati of West Jordan, who was sporting both a “Make America Great Again” hat and a Romney campaign t-shirt. Romney has repeatedly said his relationships with sitting senators of both parties and other Washington influencers – built through his work as governor of Massachusetts and years of campaigning with other Republicans – would give him a leg up in crafting and passing legislation. The businessman and former presidential nominee faced a few hurdles during his run. The state’s more conservative Republican delegates forced him into a primary with Mike Kennedy, a state lawmaker from Utah County whom Romney trounced in their June contest, 71 percent to 29 percent. With Republicans appearing to maintain a majority in the Senate, Romney is more likely to get legislation through Republican-controlled committees. According to political historian Eric Ostermeier, Romney will become the first Senator in modern history who also served as governor of another state. Retiring Sen. Orrin Hatch, who has held the seat for more than four decades, bid farewell to the state GOP Tuesday night and wished Romney luck. With a comfortable lead in the race to be the next U.S. senator from Utah, Mitt Romney is using his name recognition — and significant campaign war chest — to get out the vote for other Republicans. During their only meeting before the Nov. 6 election, Senate candidates Mitt Romney and Jenny Wilson kept the debate civil – even friendly at times – as they recalled working together during the 2002 Winter Olympics, though Wilson got in a few jabs against what she called Romney’s inconsistent record on several issues.